The Vestibule of Eros and Pan is found in a huge Villa that was built in the 4th century AD, in Sicily. The floors of this villa are covered with amazing mosaics (over 3000 square feet of mosaic artwork) and obviously belonged to a very wealthy man. In this floor section, we have what is called the Vestibule of Eros and Pan. Pan (the god of the wild) is engaged in a duel with Eros (the god of love). The man standing beside Pan in the purple toga and the crown, is Silenus (associated with the god of wine), and he is signalling the start of the match with his raised hand. The figures behind Pan are his supporters made up of maeneads and satyrs, figures from the cult of the wine god Dionysus. Eros is supported by a group of women and children who may have represented the lady and children of the household. In the centre of the mosaic there is a table, holding jars of prizes for the winner, and under the table are money bags. On the money bags is the writing for 22 denarii. 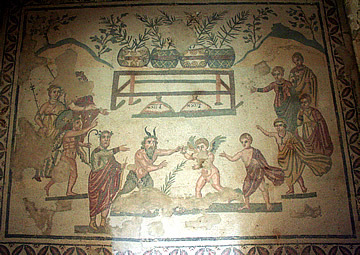 This mosaic can represent the fight between the profane/wildness represented by Pan, and sacred love, represented by Eros. The figures and objects including the table and the trees are all the same size, so there is not really any sense of space or 3-dimension. There is use of line in the frame around the scene, and some pattern in there. The artowork is made of mosaic in warm colours. The surface must have been smooth when it was made, but now it looks a bit chipped away at and a bit of a rougher surface.